We are here to fill your buckets with some of our weekly INSPO and our #NEVERMISSAMONDAY roundtable talk. (we realize it is Tuesday, but real life and kids off school has us a bit behind!). Today we are talking about plans. About the fact that imperfect plans for the present, far outperform perfect plans for the future. Often times we can be our own worst enemy when it comes to taking action. We build up this notion of doing things “perfectly”, and if all of the conditions don’t seem exactly right, we just don’t do it at all. But today, we are here to flip that script right on it’s head! BAM! Soak that in for a second, as we did after first reading it. There’s no guarantee in next week being any better and so next week soon becomes next month, and then next year and pretty soon – never. EVERYTHING could change, or not. You just don’t know. If you keep waiting for perfect conditions to get things done, you will wait forever. There is no perfect scenario in life. Life is life, things change and happen every day that are out of your control. How you handle that change with ACTION is up to you! Life is 10% made up of what happens to you and 90% how you react. So what we want to do today is: take pen to paper and make a plan for THIS week. Yes, this week, we know it’s Thanksgiving, that makes it even more important to do! Holidays are such a special time, but we can really get caught up in all the details – from food, to travel, to family, and a wide range of emotions. So much can throw you off track in staying mindful, positive, getting in movement each day, and nourishing your body with nutrient dense food. Monday – what’s your plan for today? Haven’t worked out yet? Commit at least 5 minutes to movement. Right it down, set a time next to it, and do it. This is on Maria’s refrigerator right now. She’s a VFit trainer and VFit Squad certified nutrition coach for members. There’s nothing cute about it and no one will ‘pinterest’ it for its design, but it’s a functional good plan for her workouts and meals for the family for the week. 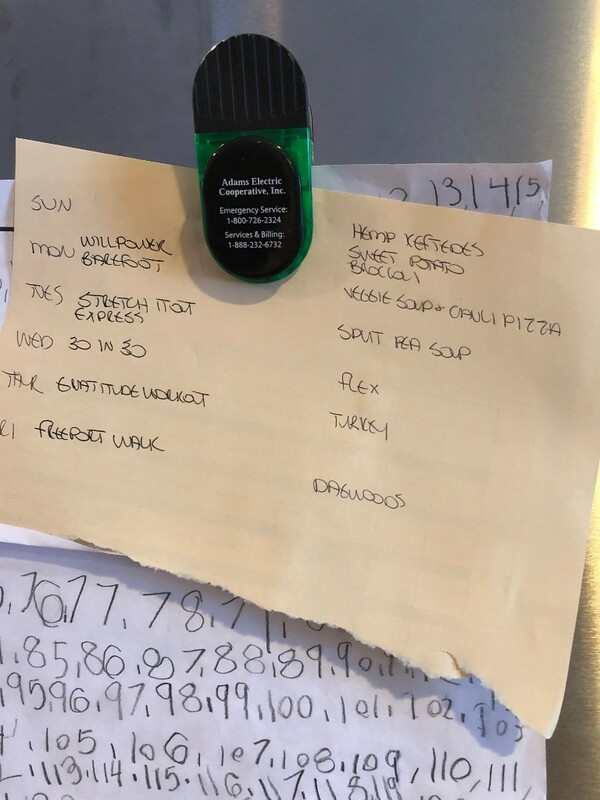 Every single week, even if she doesn’t follow the plan exactly, she commits to writing up her workout/meal plan and puts it up on the fridge. Where she can SEE it every day and be motivated to do her best. We firmly believe in planning both here at VFit and VFit Squad (our supplemental nutrition program for members) and although it may SEEM like more work than you have time for, it actually takes away a ton of guesswork from the week – once again buying you time in your precious and busy life. Even a chicken scratch plan will save you from the panic of “What do we eat? It’s now 5pm and everyone is HANGRY – so takeout once again it will be” moments, because you already have what you need on hand for meals. At VFit, we ask our team to book their workouts by reserving a spot in our classes. This isn’t meant as punishment. It’s proven accountability and even if you miss 5 of your 10 planned workouts, we guarantee the 5 you made would be more than if you didn’t book any! VFit ‘studio’ is your bedroom, your living room, your basement, garage, hotel room, inlaws hallway, you name it! All across the country teammates of our studio do the same. What all ACHIEVERS have in common is the ability to PLAN and then TAKE ACTION. They get their workouts in because they’ve prioritized and set aside that time and made that commitment by singing up. They get healthier meals in because they have planned them out. On crazy busy days like Tuesdays where the kids have swim, Maria knows to have a slow cooker dish going all day so there’s good food to eat, or has planned out leftovers to still get in good food. Stop waiting for perfect, embrace the beautifully imperfect nature of your life and get ‘good plans’ in place to help guide those weeks! Our jam packed live streamed online fitness classes start at 3A PST and go all the way to 9PM PST many days. We even have a VFit EXPRESS series of classes Monday through Friday that are 15 minutes start to finish. And if you can’t get a live class, we offer a full video library of on demand classes of each of our formats. Feeling like moving forward with your (im)perfect plan today? We sure hope so! Shoot us a note and let us know what option you are going for? We truly hope you take us up on some of these ideas and bring more movement into your life today and every day.